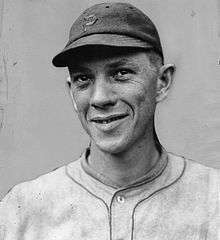 Arley Wilbur Cooper (February 24, 1892 – August 7, 1973) was an American left-handed starting pitcher in Major League Baseball who played most of his career for the Pittsburgh Pirates. A four-time winner of 20 games in the early 1920s, he was the first National League left-hander to win 200 games. He established NL records for left-handers – second only to Eddie Plank among all southpaws – for career wins (216), innings pitched (3466⅓) and games started (405); all were broken within several years by Eppa Rixey. His career earned run average of 2.89 is also the lowest of any left-hander with at least 3000 innings in the NL. He still holds the Pirates franchise records for career victories (202) and complete games (263); he also set club records, since broken, for innings (3201), strikeouts (1191), and games pitched (469). Cooper died of a heart attack at age 81 in Encino, California.